Those of you who follow my blog will understand that this photo means I am an honest woman. 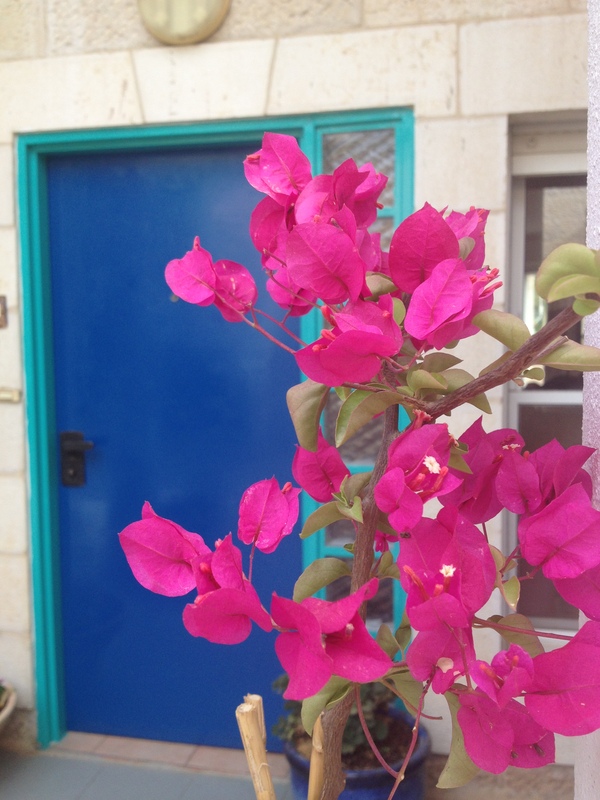 I said in my March blog post that I would paint my front door blue, in tribute to the blue city of Zefat. Though my landlord did the painting, I chose the colors. Feedback has been mixed, but being a writer, I am so used to rejection it barely fazes me anymore. I wonder if I chose the blue in order to buy the hot pink Bougainvillea. I’ve earned these colors, after forty-six years in Israel. That’s right, my new life began when the Six Days War ended, forty-six years ago. Ahh Victory! Ahh Youth! I am feeling so uplifted during this first week of June that I have thrown away all my rejection letters received over the past thirteen years. I cannot recommend this act highly enough. Currently, I am in a condition of 100% acceptance. If I don’t send any of my new writing to anyone ever again, I might be able to maintain this status forevermore. Of course there is no possibility this will happen because I have fresh confidence in my writing. I ascribe this unfamiliar attitude to my new writing room, otherwise known as The Writing Pad. There, several hours a week, I sit with my back to the gardens and Jerusalem hills and concentrate on my current project. Within arm’s reach are all my journals; early, mid and late writings are organized on low shelves. Choice letters from loved ones are easily accessible in an open box. Spending time in this room enables me to reconnect with the romantic girl I was forty-six years ago, the girl who fell in love with Israel and never dreamt of the consequences. I rather like her. I’m reading her Honors Thesis now, while writing about her college graduation. Spending a few hours in the Judy Stonehill Labensohn Archives has been better than twenty years of therapy. Ahh Spring! What a glorious time of year to dive deep, loosen the roots and bloom as bright and as happy as any Bougainvillea in the Middle East. This entry was posted in Identity, Rejection and tagged rejection letters, used to rejection, writing room. Bookmark the permalink. What a wonderful entry. I love the archives as better-than-therapy! I would have done the same – if I’d had the courage to think of it for my front door. But your door needs to meet my new bathroom FLOOR in Bet Hakerem. They are related. You are always a pleasure and an inspiration, Judy. Colour on. Thank you, Frances. Perhaps we can do a shidduch between your bathroom floor and my door. I know what you mean. I love to write in our beautiful garden, with its view of the Jerusalem Forest. Your blue and pink look perfect together. I love the blue, and even more, I love your celebration of your boldness and freedom. I LOVE the blue door, especially with the turquoise frame. It sounds like a lovely place to find focus! Inspiring.